On May 20th, 2016 Forum Obywatelskiego Rozwoju (FOR), in cooperation with Austrian Economics Center, Liberty Fund, SKN Spraw Zagranicznych SGH and SKN Ekonomicznej Analizy Prawa SGH as well as with many Local Partners by the likes of the Libertarian Association have the pleasure to invite you to take part in the international conference Free Market Road Show 2016 which will be held at the Warsaw School of Economics in Warsaw, building G (near metro station Pole Mokotowskie), Aula VII (3rd floor), from 9:00 A.M. to 13:30 P.M.
Free of charge mandatory registration HERE. 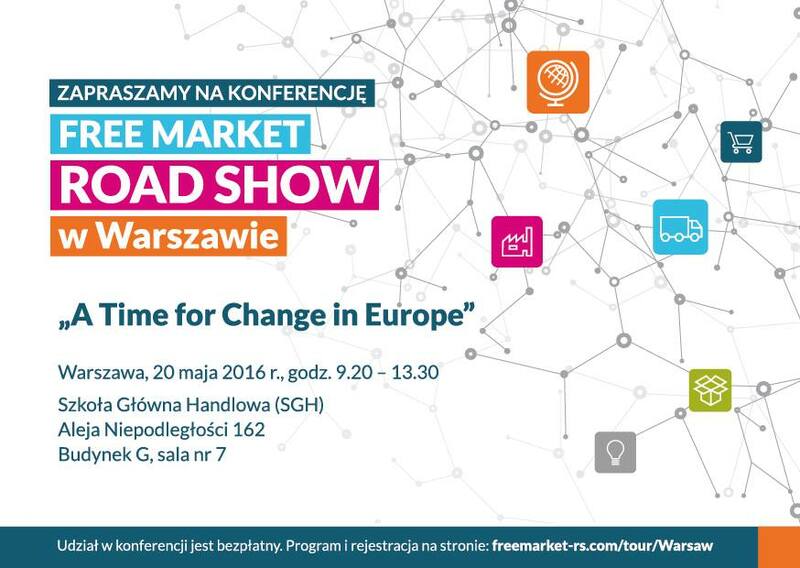 See you in Warsaw on May 20th! Panel 2. Future of economic growth and rule of law in Poland?